Annabelle: Creation is the third origin story of an evil doll that falls under The Conjuring series. This film tells the story of a group of orphans who are placed in a home that is owned by a doll maker and his wife who had lost their daughter in a fatal accident. Two orphans Janice(Talitha Bateman) and Linda (Lulu Wilson) discover the infamous Annabelle doll that we are all too familiar with and all hell brakes loose. If you are thinking “hmm it sounds like I have seen this movie before” it’s because you have. Anabelle: Creation is nowhere near horror movie perfection, but it is not an awful film. Is it a great film? No. Annabelle: Creation lies in the middle of the spectrum. Going into this movie I wasn’t expecting much, I mean it’s a prequel of a prequel of a prequel. I wasn’t impressed with Gary Dauberman’s first film Annabelle, so my expectations were set pretty low. Much to my surprise, Annabelle: Creation was light years better than its sequel. It was an enjoyable film; I personally thought it was quite a bit of fun. The acting was great; when it comes child acting it can be a hit or miss, but actress Talitha Bateman was spectacular. She really kept the film going, delivering unsettling facial expressions and disturbing behavior. Lulu Wilson, who also starred in Ouija: Origin, another prequel did amazing as well. Her character Linda was what I like to call the Audience Advocate. She made the choices we the veiwer would have made if we were in her position. The other actors in the film made their presence known, but it wasn’t quite as strong as Talitha Bateman and Lulu Wilson. The actual story is where the film begins to fail, various scenes towards the last act were illogical sequences. I found myself asking “how did that happen?”, “Why didn’t anybody notice this?” or ” How did she escape?” but that falls mainly on Gary Dauberman the screenwriter and also the film editor. I was skeptical as to how this story was going to tie around back to Anabelle. With out giving away any spoilers the ending made sense and summed up Annabelle’s origin pretty well. Let’s Answer the question everybody wants to know ” Is it scary?” I would have to say…no. There we a few good jump scares placed throughout, though as an entirety it’s not a scary movie. Many of the scary scenes are built up quite a bit and unfortunately became predictable. Annabelle is a creepy porcelain doll with a great evil attached to it; there is only so much that can be done horror wise. Visually this movie is stunning all thanks to new Hollywood director David F. Sandberg who also directed and wrote Lights Out, which was one the stand out horror films of 2016. The cinematography is exquisite; the scenes are captivating keeping the film visually interesting. The scenes that were terrifying (if any) were the result of outstanding camera work. 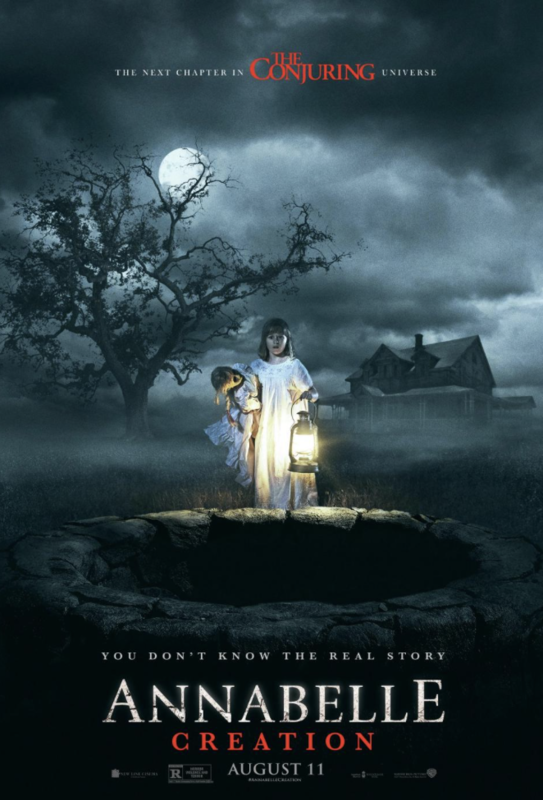 Annabelle: Creation is a good movie if you love The Conjuring series, other than that it’s a well-shot horror film filled with anticipated jump scares. It certainly isn’t an instant horror movie classic some are claiming it to be. Watch the trailer here.